related counterparties. However, the existing approach sets limits only on the amount of credit facilities granted by a bank. 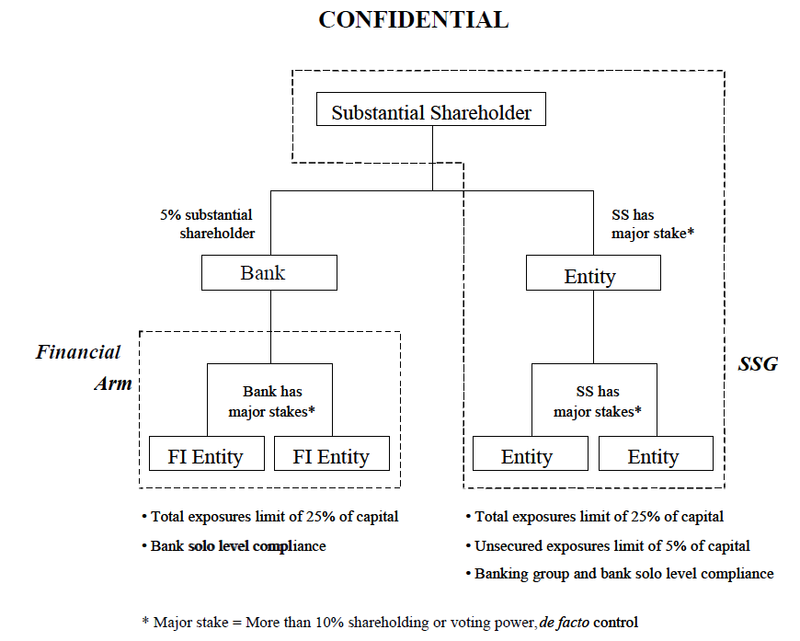 It does not capture all of a bank’s exposures to a counterparty that could lead to losses to the bank, e.g. from the diminution in value of equity investments, or from the cost of replacing off-balance sheet transactions, in the event that the counterparty fails. 2.2 A more all-encompassing exposures-based approach that seeks to capture all on- and off-balance sheet exposures will transform the section 29(1)(a) single borrower limit and the section 29(1)(b) substantial loans limit into large exposures and substantial exposures limits, respectively. This approach to setting prudential limits based on exposures is consistent with the practice in most major jurisdictions. 2.3 Instead of setting out a prescriptive approach for the computation of exposures, a general definition of exposures is proposed to provide the key guiding principle for determining the nature and size of an exposure: An exposure is the maximum loss that a bank may incur as a result of the failure (assuming no recovery value) of a counterparty to meet its obligations to the bank, including losses that may be incurred on credit facilities, equity investments, contingent liabilities, or other transactions with the counterparty. 2.4 Specific provisions made against an exposure may be netted off against the exposure amount. Annex A proposes changes to the valuation methodology, as well as illustrative examples of how the exposures generated by various transactions may be computed. 2.5 A bank does not need to count towards the limits an exposure to the issuer of an asset if the title to the asset and the associated risks and rewards are completely transferred to another party with no recourse to the bank. Examples include outright asset sales and fully funded synthetic asset securitisation transactions which satisfy the clean sale criteria detailed in MAS Notice 628. The requirement for a synthetic sale to be fully funded, i.e. accompanied by cash payment or deposit, minimises the bank’s exposure should the transferee default and is consistent with the recognition of cash as qualifying collateral in the following paragraph. 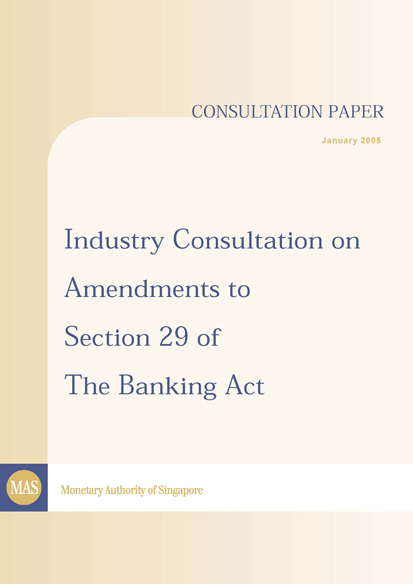 2.6 Section 29(2) of the Banking Act exempts certain transactions from the limits in section 29(1). We have reviewed the relevance of these exemptions, and propose to remove the exemptions for the following transactions as there is little prudential justification for continuing to exempt such transactions. a) The purchase of telegraphic transfers or loans or advances made against telegraphic transfers. b) Any facility granted against letters of credit or bills or guarantees or documents in respect of imports into or exports from Singapore. Corporate credit card facilities granted by a bank will continue to be an exempted transaction if such facilities are fully secured by cash collateral. 2.7 We also propose in Annex B a number of revisions and additions to the list of exemptions, taking into account practices in other advanced jurisdictions, as well as the prescriptions in the Standardised Approach to capital requirements for credit risk under the new Basle Capital Framework. The revised list of exemptions includes, inter alia, exposures to certain categories of sovereigns and selected multilateral development banks, as well as exposures to banks in Singapore with residual maturity not exceeding one year. 2.8 For an exposure that is secured by cash or government securities, the value of the collateral can be used to offset against the amount of the exposure provided the collateral satisfy the conditions set out in Annex B. 2.9 The existing section 29(1)(a) single borrower limit is set as a percentage of a bank’s capital funds. We propose that for compliance with the relevant provisions of the Banking Act, including section 29, by banks incorporated in Singapore, “capital funds” be replaced by “eligible total capital” as defined in MAS Notice 637. Eligible total capital include innovative Tier I and Tier II instruments as capital, with deductions made for goodwill and investments in unconsolidated banking and financial subsidiary companies. 2.10 The definition of capital funds for foreign bank branches will remain unchanged3. eligible total capital or capital funds, as the case may be. The aggregate amount of all such substantial exposures will continue to be limited to 50% of total exposures. 2.12 To facilitate greater supervisory flexibility, we propose to amend the Banking Act to permit MAS to raise the single counterparty exposures limit in section 29(1)(a) and the substantial exposures limit in section 29(1)(b) for individual banks on a case-by-case basis, subject to conditions that MAS may impose. However, MAS will not ordinarily approve any application for higher exposure limits unless it is supported by strong justification.